Possibly related Question. — Possibly related Question..
Browse other questions tagged sound pulseaudio alsa soundcard preferences or ask your own question. 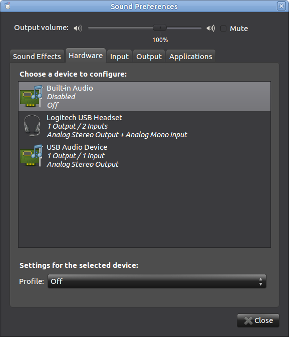 Assign programs permanently to different sound-outputs in Pulseaudio? Which sound profile will allow me to simultaneously hear and record system audio + microphone input? How to merge both audio channels into left channel? Successfully connected to a bluetooth speaker, but how do i direct sound there? How to use speakers as sound input device?